I used to be so very afraid of sharks. 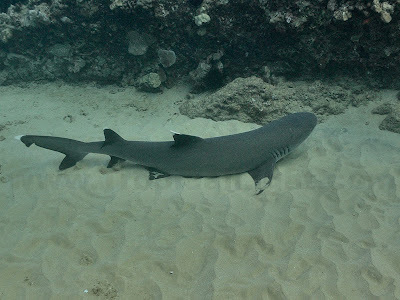 I remember being out on a Sunday swim with my friends when we saw a White Tip Reef Shark swimming below us. We all cautiously followed behind it - until it turned around. Boy did we take off swimming in the other direction in a hurry!! Now when I see a shark, I try to get a closer look and photo if possible. Quite a change. I have gotten bolder around all kinds of large underwater critters. 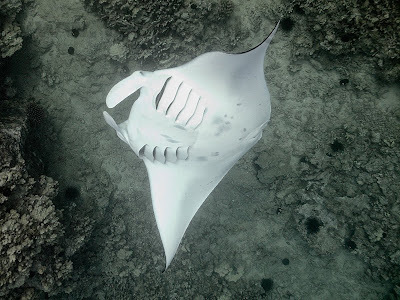 I was able to get fairly close to both this morning's shark and to this Manta Ray as it was doing repeated back flips. Fun, fun, fun.